Our vehicle was converted into a rough-terrain ambulance. We would take wounded along with us, back through the mountain pass to somewhere near Miyazaki. The armored unit sent two sedated stretcher cases back with its corpsman, and I gave up my seat to Lieutenant Donald Schupp who had been in the mine-damaged tank. His right leg was pantless and heavily bandaged, but he said he’d been hurt worse playing college ice hockey back in Mankato, Minnesota. Continuing on we passed light trucks carrying men and supplies, and armored AMTRACs hauling fuel and ammunition. Behind those we came into a thick patch of new-style heavy artillery. The big 155 mm Army artillery piece has been fit onto a large tracked chassis and armored all around for near-front-line combat. It’s not a new idea, but this was the newest model. 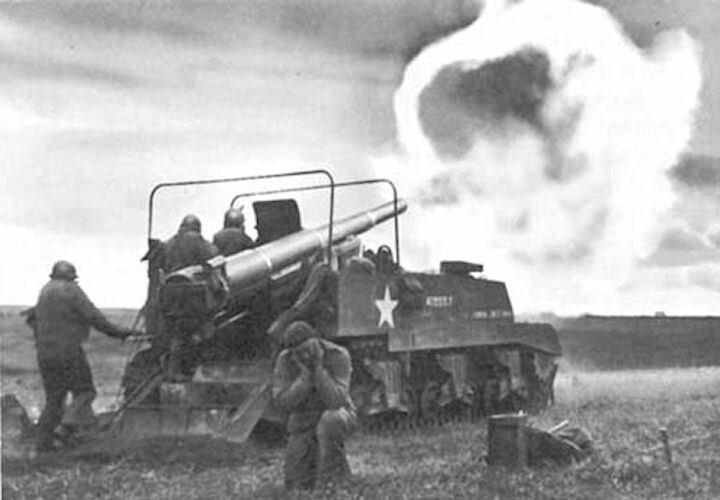 They call it a “self-propelled howitzer.” It looks fearsome from the front. But behind them I counted at least three support vehicles for every big gun, hauling shells and fuel and supporting infantry around with them. So the armored artillery still has a soft spot. We got past just in time not to be deafened by a handful of registration shots. The howitzers would be there a while, behind the tanks they supported and which protected them. The first medical post of any substance we passed flagged us down and asked directly, “You hauling live or dead?” We had live injured, so they did not try to burden us with dead to take back. Lieutenant Shupp explained that they hit little resistance during the drive but were taken under by snipers from several buildings along the way. Those buildings are the ones I saw burning. The last town before we would turn onto the mountain pass was the market and transit center for the area. Its market center backed up to a rail depot where people and goods could be sent in to the city or out to the coast. Bulldozers were working in teams to remodel the city, which had been heavily blasted by earlier bombardments. We drove parallel to the tracks for a ways before turning east back into the mountains. Sergeant Dunklin drew a line in the air where the railroad continued into the next bunch of hills. “We’ve got teams on those tracks already, trying to get them open. There’s a railroad tunnel through the last mountain. We blasted one end shut before we even landed. The Japs blew up the other end when they pulled back.” Our vehicle lurched forward down into a washed out hole in the old river valley road, then motored up the other side.